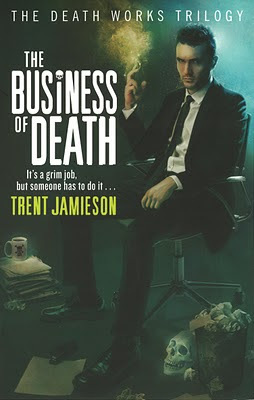 This omnibus edition features the third novel, THE BUSINESS OF DEATH, which has not been published before. Life is tough at the top when work is a matter of life or death. It s one thing to run Mortmax International as head of a team, but it s quite another to rule alone. Staff fatalities have left Steven by himself on the Throne of Death, and there's no time to get comfortable. The Stirrer god's arrival is imminent, threatening life as we know it. Plus Steven has managed to mortally offend the only ally strong enough to help out. And how can he ask someone to marry him when the End of Days seems inevitable As if they re going to think he's committed. The portents don t look good as a comet burns vast and looming in the sky and Steven can almost hear a dark clock ticking. He will have to play nice if he wants his ally back, and must address the madness of the Hungry Death within himself if he even has a chance at defeating the Stirrer god. If he fails, Hell and Earth are doomed and wedding bells will be quite out of the question. THE BUSINESS OF DEATH includes the first two volumes of the Death Works trilogy, "Death Most Definite" and "Managing Death", as well as the third volume. This edition actually contains the three books in the Death Works trilogy. I've already read DEATH MOST DEFINITE and MANAGING DEATH. So I was looking forward to reading the third book, THE BUSINESS OF DEATH. Steven de Selby's life is very complicated. He's Death, which means dealing with a very dark power from within, the Hungry Death. There's also the Stirrer god very close to breaching our world. And the Death of the Water is also very angry with Steven and wants revenge. The Business of Death is another thrilling ride, with Steven in the driver's seat. He makes one hard decision after another and although he sometimes doesn't believe in himself, he always pulls through. Even when he's got no choice but to lead the Pomps into war. Also, his decisions in this installment lead to some very unhappy--yet self-sacrificing--consequences, but the story was action-packed and the conclusion is heartbreaking.